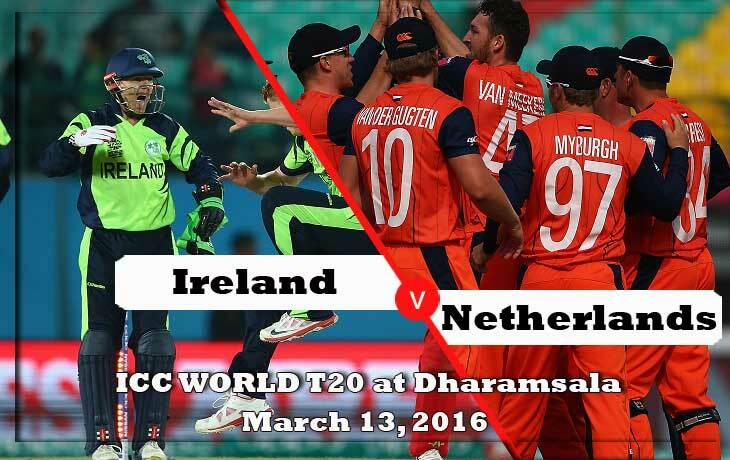 Ireland vs Netherlands, the eleventh Qualifier match of ICC World T20 2016 will start at 15:00 IST (09:30 GMT) at HPCA Stadium, Dharamsala, India on March 13, 2015. In last T20 world Cup 2014, Netherlands chased the Ireland’s biggest score within 13.5 overs. In that match, Stephan Myburgh scored 63 runs out of 23 balls with Seven sixes is the sensational hit of the day. Both of them will play the game again in this ICC World T20 2016 qualifier round. In the Match 4 ICC T20 World Cup 2016: Ireland lost their match against with Oman by two wickets. But the top line-up’s Gary Wilson, William Porterfield and Paul Stirling are played well and scored 29, 29 and 38 respectively. On bowling, the Kevin O’Brien, Andy McBrine and Max Sorensen are picked two wickets each. In the Match 8 ICC T20 World Cup 2016: The match was delayed because of rain. Even though, the ICC association can’t able to continue the match. Bangladesh played only 8 overs, Tamim Iqbal scored 47 runs by 26 balls. The match was cancelled after the Andy McBrine’s and George Dockrell’s picked one wicket each. In the Match 3 ICC T20 World Cup 2016: Netherland lost their match against with Bangladesh by 8 runs. The team captain, Peter Borren scored 30 runs as a highest individual score of the innings. The team failed to score the remaining eight runs with 20 Overs. Timm van der Gugten bowled well and took three wickets by giving 21 runs. In the Match 7 ICC T20 World Cup 2016: This match was abandoned with a toss due to rain.